PA Chairman threatens to end peace talks and turn to international institutions unless Israel freezes construction in Judea and Samaria. Palestinian Authority (PA) Chairman Mahmoud Abbas is threatening to end the negotiations with Israel unless it freezes construction in Judea and Samaria. Abbas’s threats came during his meeting on Monday with Meretz Chairwoman MK Zehava Galon. “I will put the keys on the table and turn to international organizations,” he declared during that meeting. 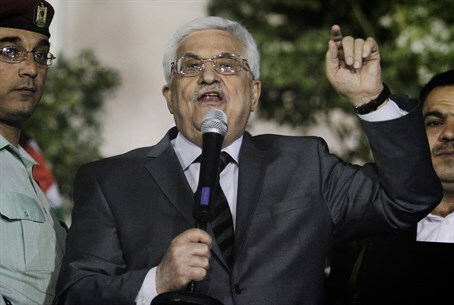 "The only way we will agree to extend the talks is if Netanyahu announces a settlement freeze and the release of other prisoners beyond the next scheduled release,” Abbas told Galon. This is not the first that Abbas has imposed preconditions on talks with Israel and threatened that unless all these preconditions are met, there will be no peace. It is also not the first time that the PA threatens that if peace talks fail, it will go to the United Nations and unilaterally seek statehood recognition there. After Monday’s meeting, Galon wrote on Facebook that she had told Abbas that Meretz has “an unwavering commitment” to the peace process. “I told him that our commitment is backed by 76% of the Israeli public and 77 Knesset members who support a peace agreement, and what is needed right now is a determined and courageous leadership that will continue the negotiations that it began,” she wrote. Galon went on to blame the Israeli government and Prime Minister Binyamin Netanyahu for the fact that peace talks were not advancing. “These, my friends, are the distorted priorities of the Netanyahu government. One hand builds settlements and the other hand flies to Obama to tell him stories about peace,” wrote Galon. Meanwhile on Monday, Netanyahu told President Barack Obama that over the past 20 years, Israel has made every concession possible to the PA, while the PA has responded with terrorism.